From today’s Oregon Save Our Schools Newsletter (subscribe here!). You have to admire a bureaucracy that creates a reality distortion field as powerful as the one the Oregon Department of Education (ODE) has built around Common Core and SBAC. And now, there’s a rush toward a CCSS/SBAC masterstroke without ever taking time to evaluate if these standards and tests are good, productive, or helpful. And how would ODE do this? By putting in place a circular, self-fulfilling mandate. Really? This untested system of standards and tests is being mandated as THE new standard required for college? What gullible and naïve college admissions team signed up for this? Apparently the one used for admissions by our Washington university system neighbors. If ODE has its way, Oregon won’t be far behind as seen in the above quote. We also see it in the organization called “Oregon Core to College” which is a multi-year effort with four goals (sorry – “outcomes” to use official state jargon) including “Postsecondary use of the Smarter Balanced assessment as a means to demonstrate readiness for transferrable, entry-level, credit-bearing college courses”. It’s breathtaking really. Common Core remains an untested theory. ODE wants to rush to bet everything on it – and they probably hope to put a stop to opposition with this move since few parents will risk a child’s future by Opting Out of college entrance exams. Our guess is that ODE doesn’t want to wait for the data because data might show that CCSS/SBAC hurts, rather than helps, our schools. It might show that CCSS/SBAC might be a worse judge of college readiness than, say, grades. Or even prove that ODE is draining $300M per year from classrooms. At this writing SBAC tests are being used for the first time ever. We have no data about what they mean, no data about whether they help students, and certainly no data to prove that specific SBAC test scores predict a student’s success in college. ODE’s rush probably reveals a desperation. ODE has clearly failed to convince parents, teachers, and administration that CCSS/SBAC are the godsends they promised. And there’s much higher legislative concern in the session right now than ODE has ever seen. This is desperation — to dash ahead without waiting for data to learn whether their theories are right. ODE needs to be patient — it will take years (YEARS!) before there’s enough data to even know if CCSS does no harm. To learn if it does good? That’s even further off. We shouldn’t be surprised. The history of corporate reform and high stakes tests shows the same pattern every time: Proponents declare immediate success. But once it’s available, the data shows little or no improvement, and sometimes serious harm. This is true of the NYC reforms of the late 1990s, the San Diego reforms of the early 2000s, the “New Orleans Miracle” that wasn’t, and the bust/sham called the “Texas Miracle” that started NCLB (before the data was in). We need parents, educators, legislators, and our new Governor to stand tough: There’s no evidence today that CCSS makes kids college ready or that CCSS helps kids be more career ready. ODE should NOT be rushing into college admissions. That said, we shouldn’t be surprised ODE is rushing things. They threw out 10 years of OAKS high stakes testing without even holding public hearings to determine whether OAKS had done any good. 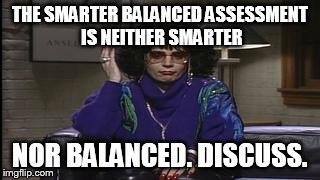 Now they’re rushing to judgment on CCSS and SBAC. For an organization that prides itself on using data well, ODE clearly doesn’t want the data – they just want to claim victory. Our school sent a letter home to some students stating that the SBA will be used in 7 Universities and a number of community colleges in lieu of a placement exam. This information is not correct. I called four of our universities, UofO, OSU, EOU, and WOU and not one of them is using SBA for class placements. Some use the SAT, but if the score is too low, they recommend taking their placement exam but is often times optional.